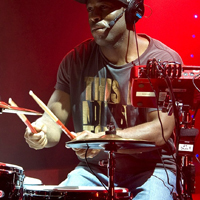 Hybrid drum sets are the fusion between acoustic and electronic drum sets. They produce a sound where the drummer wants both authentic acoustic sounds as well as triggered electronic sounds and effects. The idea of going electronic may seem like a daunting task for many acoustic drummers. 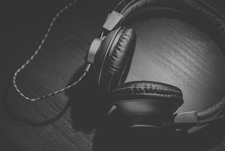 However, it is actually very easy to start experimenting with electronic sounds. You can start off small and increase the range of electronic sounds on your kit as you get more comfortable. 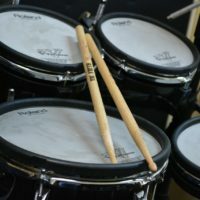 In this guide, I am going to explain four techniques to create hybrid drum sets: Drum triggers, sample and percussion pads, pads, and electronic drum heads. Before we continue, have a quick look at the following video. This is Ben Barter, the drummer from Lorde. 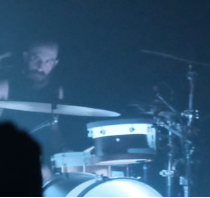 Ben plays an extremely hybrid drum set. In fact, this is edging much more towards the electronic, but you don’t have to go as extreme as this. Ben really nicely demonstrates the use of drum and percussion pads, drum triggers, and extra pads in one hybrid set up. So I would recommend looking at this video and then reading on afterward. 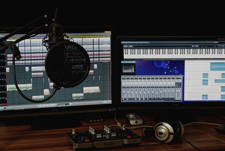 Sample and percussion pads are perhaps the easiest way to go electronic. 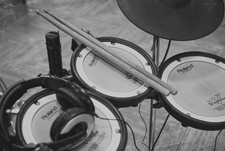 You can keep your acoustic set exactly the way it is and simply purchase a drum pad such as the Roland SPD-SX or Yamaha DTX Multi-12 that can be played on the side. These pads include simple audio jack outputs, which can be easily connected to the sound engineers mixing desk for live performances. These are also particularly easy to use because they do not require separate drum modules to operate, as both the ‘brain’ and pads are in one ready-to-go box. To learn more about sample and percussion pads, see my guide on choosing the best production and drum pad for your own needs and budget. I need to talk about Drum modules before we continue with the next options for creating your hybrid drum set. These are the ‘brain’ of electronic drums. You may have multiple pads or cymbals on your set, but they all communicate with the drum module in order to trigger sounds. The drum module is what you would connect to the mixing desk or interface. The Roland TM-2 Trigger Module is an example of such a device. There are many other drum modules on the market, including cheap options as well as much higher end modules such as the new TD-50 drum module. These little devices simply attach to the rim of your acoustic drum and lightly press against the drum head. You then connect the trigger to a drum module by a wire. When you hit your drum head then the trigger will pick up the sound and then trigger a sound on the drum module. These are incredibly simple to set up. You can generally adjust the sensitivity of the trigger based on your needs. Drum triggers are a very useful solution to either replace drum micing or supplement drum micing. For example, in a live performance, you could mic up your acoustic drum but also trigger an electronic drum sound on top of this. This way could you could get layered beefy sound on your kick drum without having to rely on the room or the sound engineer. This is an incredibly useful tool for pop or electronic drummers, or drummers that regularly play in small venues where sound may be unreliable. Using a good drum module you can pitch and alter the electronic sound so that it exactly suits your acoustic drum. Alternatively, you could overlay a completely different sound like claps on top of your snare. Dual sensitive triggers. Triggers such as the Roland RT-30HR Dual Zone Trigger actually detects your rim hit separately to the main head hit. So you could set your drum module to play different sounds based on each of these. As an example, you could set the drum module to play a clap when you hit the rim. Many metal drummers have been using triggers for years to increase the sound on their fast double-kick pedal strokes. This has always been a controversial element in the heavy metal drumming community as some class it as ‘cheating’, but you would be surprised at how many metal drummers use this technique. You can buy extra drum or cymbal pads and place them in convenient locations around your drum set. For example, you could buy a rubber or mesh pad and place it on a stand somewhere around your acoustic drum set (Roland V-Pad PDX-100 mesh drum pad pictured on the right). This could trigger a different cymbal sound, drum sound, or anything you want. You then connect this to the drum module. In the video above, Ben Barter has both a mesh head to trigger a cymbal sound as well as a separate kick pedal for a more electronic kick sound. Also, most percussion pads such as the Roland SPD-SX include extra inputs for drum pads. So if you own one of these, you do not necessarily have to buy a separate drum module. This method allows you to replace your acoustic drum head for an electronic. This way you can retain the size and presence of your acoustic kit while triggering electronic sounds from them. The most exciting version of this is the new bass drum head on the Roland TD-50 drum head, learn more about the new Roland flag-ship model here. So those are the main methods to create a hybrid kit, fusing your analog and digital drumming together. I hope you learned something from this guide. If you have any questions please leave a comment below. Are you using any other techniques or method in your hybrid acoustic/electronic drum set? Leave a comment below so I can include it in this guide!